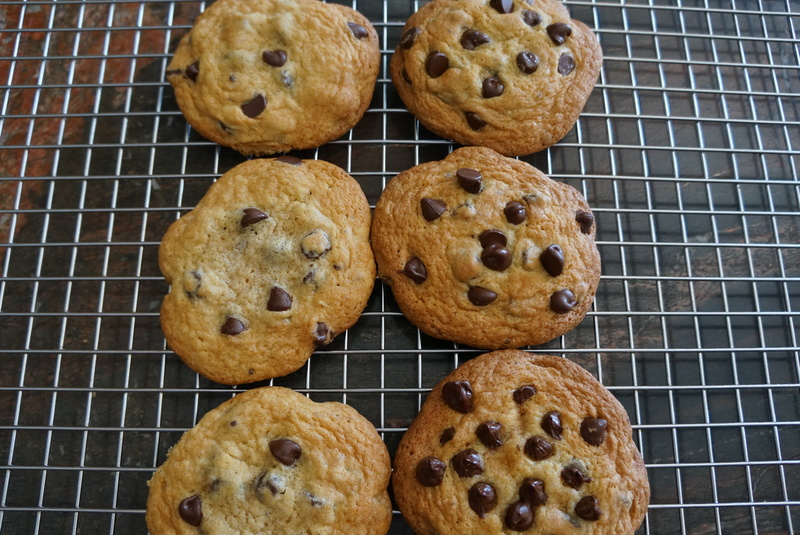 When I first made my Secret Ingredient Chocolate Chip Cookies I was a little crestfallen because they looked home-made unlike the picture I saw on-line. 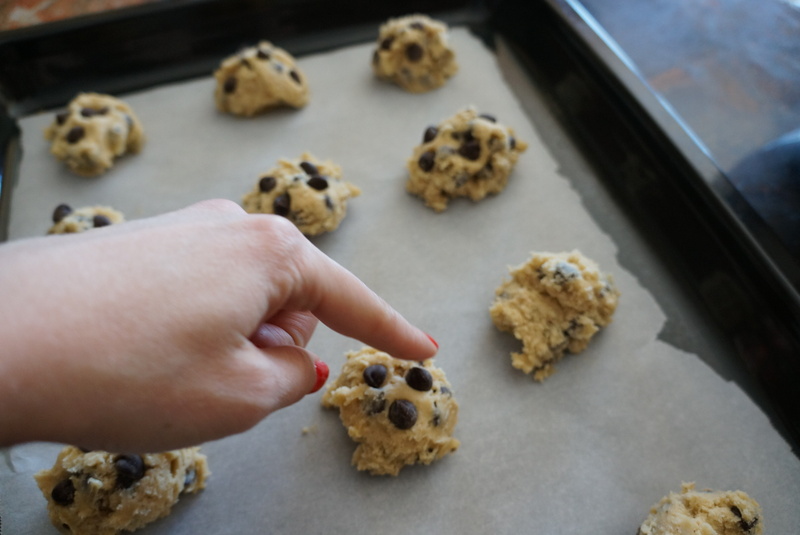 Mine had dough obscuring the chocolate chips. So although they tasted better than store-bought, they looked too “homey”. I realize that this may mostly be a concern for me as a “blogger”. I need to stand out or at least be able to stand shoulder to shoulder with the thousands of talented cooks & food stagers out there in the Blogger-sphere! 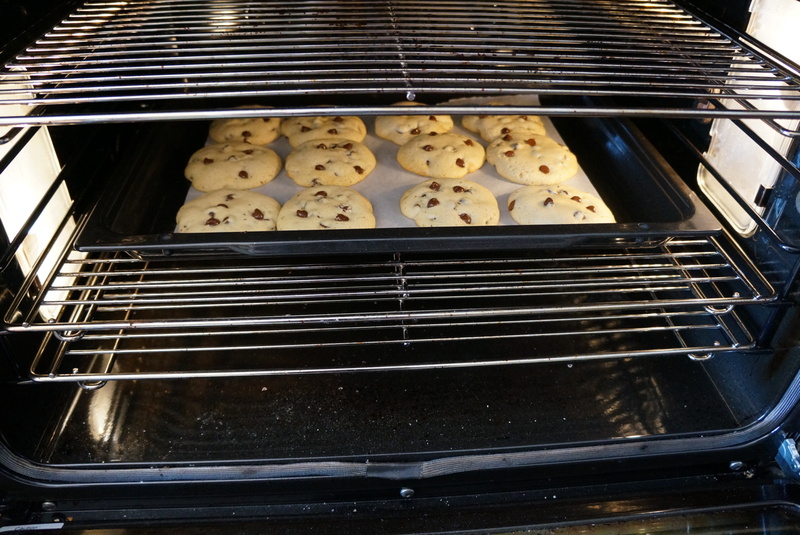 So today I made another batch of Secret-Ingredient-Chocolate-Chip cookies because I wanted to do an experiment. Also, I have been craving these cookies since the last one I ate several weeks ago. Anyway, I only put 1+1/2 cups of chocolate chips into the mix and reserved half a cup. FYI – My husband just said I should re-name my blog “Why my husband is fat” . Not my fault that he can’t have only one or two! I hid them for him. Today, its the wine cellar. After placing my mounds on the cookie-sheet, I strategically placed some chips on top, only slightly pushed in and voila!! Uhhh, not yet… Close but not quite the look I was after…Still homey. See how sparse they are? So, when my next batch went in, I added the extra chips while cooking, mid-way. I pulled out the oven shelf and lightly pressed them on and VOILA! more professional looking chocolate-chip cookies! Previous Post Best Pizza Dough Ever!